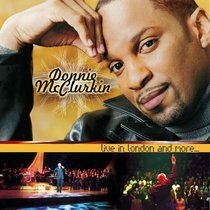 Join Gospel great Donnie McClurkin for an all-time great performance from London! This fourteen track set blends worshipful traditional gospel with upbeat celebrations and a dash of world flavor. Includes Who Would've Thought(with Marvin Winans), 'll Trust You Lord, Great Is Your Mercy, and more. About "Live in London and More"
:This recording of Live in London and More. was filmed before a packed house at the famous Fairfield Hall in Croydon, England and offers Donnie's flawless and timeless renditions of the songs you have grown to love, including "Carribean Medley," "Who Would've thought." and more.